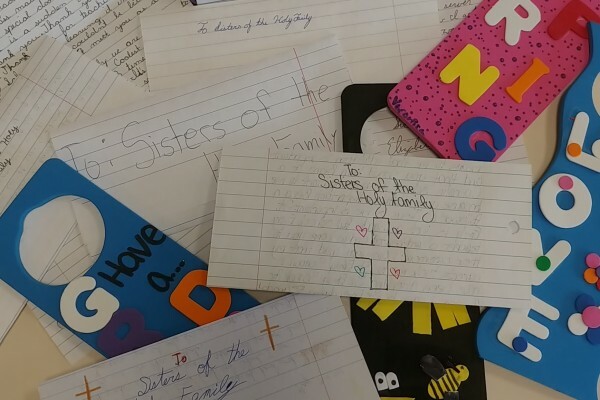 Sixth grade students at St. Emily Catholic School in Mount Prospect, IL a parish school started by the Sisters of the Holy Family of Nazareth in 1961, recently expressed their gratitude for our sisters’ work through the years by creating door hangers and writing heartfelt letters of thanks. Mrs. Gatta went on to tell her students that while priests are also always in service, they tend to get more notice than sisters because we see them at Mass. She also shared with the sixth grade students how CSFNs have played an important role at St. Emily where Mrs. Gatta has served since 1987. Both of her children also graduated from the school. The following are excerpts from these letters written by Mrs. Gatta’s sixth grade students. The students’ names have been omitted. Hello! I am… a current 6th grader going to Saint Emily School… Thank you so much for being a part of the Sisters of the Holy Family [of Nazareth], and a part of Saint Emily School. I am very grateful for all your help and contributions to our school. I am… a 6th grader at St. Emily! I appreciate all your hard work you have given to St. Emily… Being at a Catholic school is very important to me because your faith is important. Being a follower of Jesus to me is important… I hope you have a blessed day, and I hope you enjoy your day! Hello… I am in 6th grade. I wanted to thank you for keeping us in your mind and for praying for us. We, at St. Emily, appreciate all the work you did for our school… I have learned so much about God and Jesus. I also learned a lot about Mary and the Apostles… I really hope that you enjoy our door decorators. It will, I hope, light up your day. Thank you for devoting your lives to God so people will have someone to pray for them. Thank you for all your years of hard work, service, and dedication to St. Emily Parish and School. I am a sixth grader at St. Emily and I admire all you have done for me and the other students. I admire you not only for your service, but I also think you are very wise and brave for following your vocation to join the convent. You heard God’s voice calling you to become a nun and you followed this call. Please pray for people today to hear this call and answer it just as you did. Whether you taught at this school or volunteered here, your impact on the school and parish has made it a better place. God has blessed the church, school, and parish because of your prayers, and we thank you for that. At St. Emily, I am receiving a wonderful Catholic education, and you, even though I did not know you, helped set the foundation for my education. Thanks to God’s help and your prayers, I will have a bright and faithful future ahead of me. Just like priests, sisters like you are helping to make the world a better place. God will always have a special place for you in His heart. You have devoted your life to improving the lives of others. Hi… I’m in 6th grade. I wrote this letter to tell you that I appreciate what you did for Saint Emily School. I appreciate your dedication to God, your never ending love for Him. I appreciate that you basically started the school with the other nuns. You helped other people learn about Jesus Christ by starting this school. Hi!… Thank you for starting my school, my second home. I would like to thank you for all of the work you have done at Saint Emily’s. You and your other sisters have done so much for the school and parish here. You have prayed for our church and school and you might have taught here. I thank you for all that you do and have done. I am writing you because I want to thank you for all the work you have done for the church you attended… I hope you have a great day, and rest of your life. I’m in 6th grade and happy to tell you that my class made you a special gift. We made you special door knob decorations! I know this is a sudden gift, but I just want to thank you. Thank you for always being there. Thank you for teaching at St. Emily School, and leaving it in such good shape. This school couldn’t be better. One day I wish to meet you as a field trip… Enjoy your presents, and hope to see you sometime.